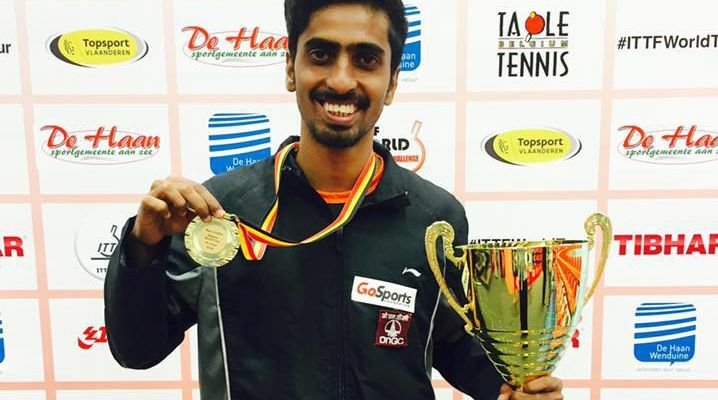 India’s top ranked table tennis player, Sathiyan Gnansekaran, secured a spot in the main draw of the Austrian Open after he defeated South Korea’s Jeong Sanguen on Wednesday. The Indian pulled off a major upset by beating the world number 17 Korean by a scoreline of 6-11, 11-13, 11-3, 11-8, 11-6, 11-2. The 25-year-old, who was the last Indian left in the men’s singles category, fought hard to earn a 4-2 victory at the Tips Linz Arena. Gnanasekaran initially trailed after the first two games but produced a stunning comeback to dump the Korean out of the tournament. “Stormed into the Main draw of the Austrian open 2018 after knocking out Asian Championship silver medalist & WR 17 Jeong Sanguen from Korea 4-2!! A special thanks to my coach Raman sir for pushing my limits and help me to achieve this huge milestone! !,” Sathiyan wrote on Twitter. In the earlier stages of the tournament, Sathiyan had beaten China’s Youth Olympics champion Wang Chuqin 11-8, 12-14, 11-8, 11-7, 18-16. The Indian ace also overcame Slovakia’s 34-year-old Lubomir Pistej in the third round of preliminaries. The Tamil Nadu-born athlete will now face off against Portugal Marcos Freitas in the first round of the main draw which will be a Round of 32 match on Thursday.